Home News Apple iPhone 8 EVT image leaked by Foxconn!! It seems nowadays its just impossible for OEMs to hide their products and renders from the outside world. Same thing happened today. The largest smartphone manufacturer Foxconn has made the biggest leak of this year , the EVT testing picture of iPhone. Apple Inc. the American multinational technology company headquartered in Cupertino, needs no introduction. There had been many rumors about the iPhone 8 just months after launch of the iPhone 7 and the 7 Plus last year claiming many high end facts. it seems iPhone 8 has been the most rumored and worst guarded smartphone of Apple with rumors nearly everywhere. 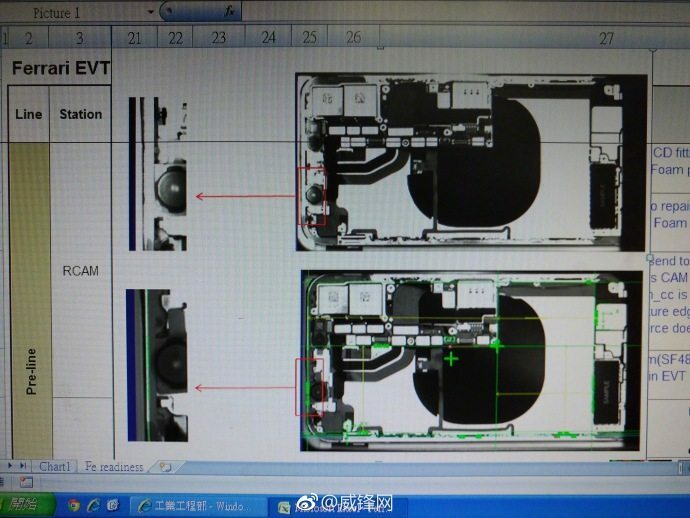 There is still almost a month for Apple to launch its yearly flagship device infront of the world, and today we got hands on a picture shared in a Chinese blogging site Weibo, showing nearly the full X-Ray of the device leaked from a representative at Foxconn. According to the picture released , it seems that the device has gone through EVT testing phase for checking the internals as per the 2D outline of the image. The picture claims that Apple will ship the iPhone 8 with a vertical dual camera setup , one telephoto lens and other a normal wide angle lens, a change from the horizontal setup last year in the iPhone 7 plus. The huge "Black Patch" as seen in the middle means that this time, yes finally Apple will provide "Wireless Charging" support to its device,which the users were waiting for a long time as other OEMs like Samsung has already implemented it in their smartphones and has been a huge hit. The battery seems "L shaped" apparently. The device is also said to come with a no button front though Apple has been in quite trouble in implementing this feature. The device may also come with AMOLED display my Samsung, popularly known as SAMOLED as rumors claims that Samsung has started OLED manufacturing process for a Apple.